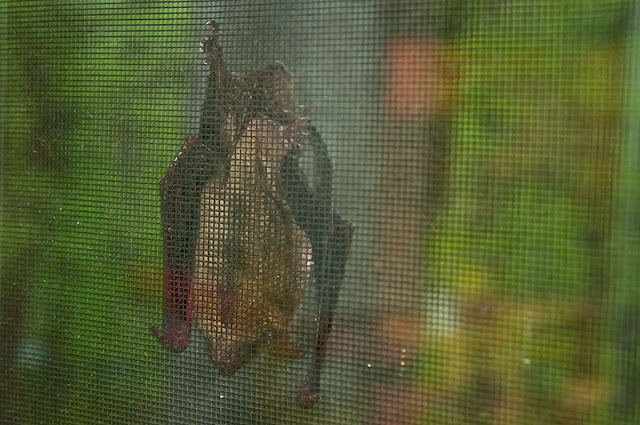 This little guy was just hanging out on a sunroom window screen when I returned from work. I think the temperature got too cold for him and he hung out for a couple days. So long that I thought he died. What do you do to dead critters? You poke them with a stick right? It was like a horror film in slow motion. His mouth slowly opened and his sharp teeth were exposed. Then he slowly closed his mouth again. Guess he was semi-hibernating in the open. Anyways when it warmed up, he was gone.